This is my lovely room. It's REALLY SMALL, but I don't need so much space anyway. In my room you find a bed, two mirrors ( yes I need 2 of them so I can see myself from the back), closet, shelf and cupboard, which is utilized for the computer. White walls, wood and black iron + purple tones. The most important thing in a small room are mirrors, which optically make the room look bigger, and a good illumination, which in my room is totally absent. Most of the things in my room are from Zara Home, which I absolutelly ADORE! 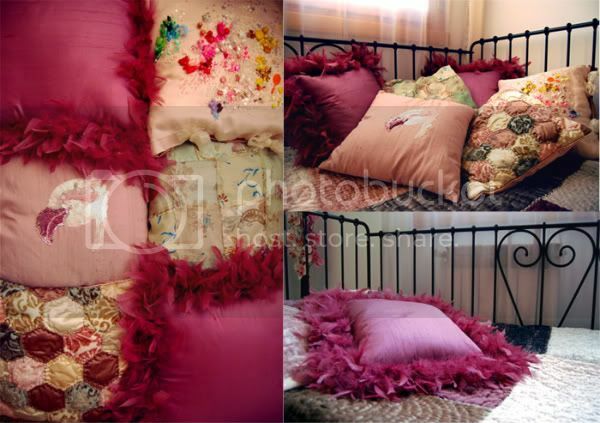 Only two pillows out of six are not from Zara Home: the first on the right side, which was made by my dear friend, Kàrt, for my birthday, and the first on the left side, second row, which I made myself, but haven't finished yet. My mom says, I've got too many of them, but they're just so adorable & cozy! such a cute and cozy bed! Love all the pillows!